The Kaliningrad Region is Russia’s most western territory. Following the collapse of the Soviet Union in 1991, the whole of Russia was thrown into a decade of turmoil, but the exclave of Kaliningrad suffered an additional and unique inequity — citizens who had previously been able to travel without hindrance suddenly found that the only land routes into “big Russia” (as they now call the rest of the country) were through neighbouring Lithuania, Poland and Belarus. The city of Kaliningrad was isolated even in Soviet times. As a key military and naval outpost, Kaliningrad was one of the Soviet Union’s “closed cities”. This status hampered the development of professional sport infrastructure. Today, as an exclave of the Russian Federation, Kaliningrad must contend with considerable logistical difficulties. The nearest large Russian cities, Pskov and Smolensk, are 600 and 800 kilometres away respectively. Border checks mean that the train journey to Moscow or St Petersburg takes a whole day, so that the only realistic option is the most expensive, air travel. For almost all of its history there has only been one professional team in the region: Baltika. After an entirely undistinguished track record in the Soviet years, Baltika surprised everyone with a dramatic run of successful seasons in the 1990s. 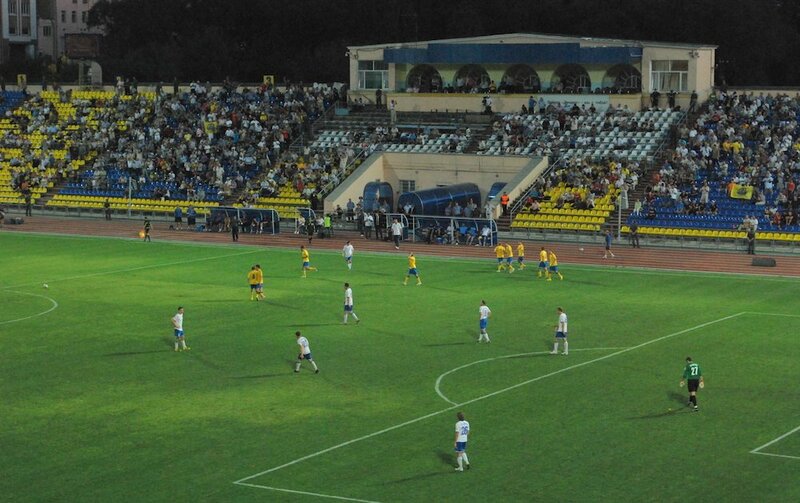 Against a backdrop of economic crisis and financial default, the team entered the Russian Premier League and even participated in the UEFA Intertoto Cup. But the good times did not last forever, and two years later Baltika fell back down to the second tier. Thus was born the tradition of the most extreme away matches in football history when Russia’s most westerly city, Kaliningrad, played against its most easterly, Khabarovsk and Vladivostok. Vladivostok and Khabarovsk are in the Russian Far East. 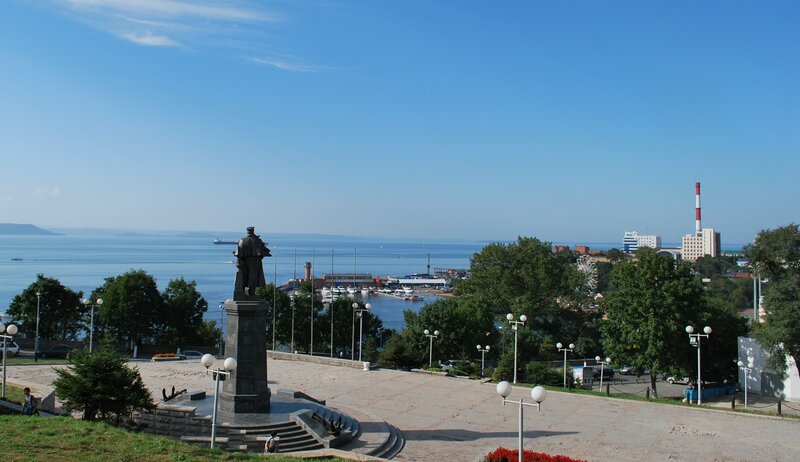 The distance between Kaliningrad and Vladivostok is 7,400 kilometres as the crow flies; betweem Khabarovsk and Kaliningrad, 7,050 kilometres. Journeys are exhausting and prohibitively expensive. Baltika fans rarely accompany their teams on these away matches. Those that can make it always try to turn the trip into an exciting adventure. Nikita Mikhailyuk is one of those lucky few who makes the trip. He has an unusual combination of professions: bread factory electrician and freelance photographer. He taught himself photography, worked for a while with Baltika, and now produces photo reports on the team’s matches for its official publication, Russian West. “In previous seasons I always tried to get to at least a few away matches. I would take a month’s holiday and make sure to get to two or three,” he recalls fondly. “I always try to spend a few days at every hosting city, so that I can get a feel for how people live there. Every city is unique and interesting in its own way.” In 2010, Nikita decided to make the long journey to the Far East to attend matches in Khabarovsk and Vladivostok. “It was such an adventure. I have relatives that live in Nakhodka, so I decided to stay with them for a month,” says Nikita. The first match was against SKA-Khabarovsk. “I arrived on the train from Nakhodka and realised that my phone was dead,” Nikita recalls, laughing. “When I got to the stadium I tried to work out where the away stands were. I asked a policeman, who looked at me like I was from outer space. I was the only one in the stands, literally no one else from Kaliningrad was there. 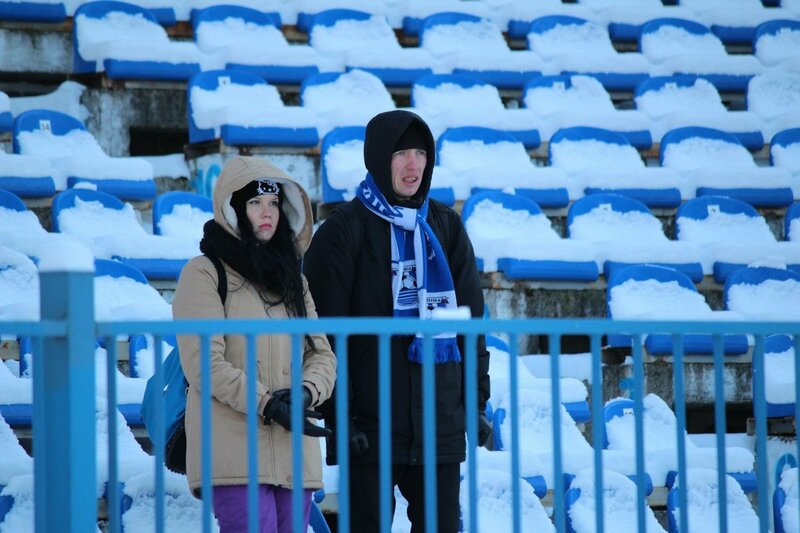 But in the first half I noticed that a couple of supporters in the central stands were wearing Baltika scarves. It turned out that they’d been born in Kaliningrad but had been sent to Khabarovsk on military service. We watched the rest of the match together”. Next he travelled to Vladivostok, which he also thoroughly enjoyed: “The stadium there is right by the ocean, which is really cool. The match followed a similar script to the previous one: in the first half I was alone in the away stands, but then I found some local Kaliningrad supporters in half time and we spent the second half supporting our team together”. Baltika, as it turns out, lost both the matches. But the players and coaches made sure to track down and thank their fans after the matches. The emigre community extends to the team, too. Two Kaliningraders are currently playing for Luch-Energiya Vladivostok. One of them, Kirill Maruschak, used to play for Baltika, for whom he scored a fantastic goal in Vladivostok during a match played under torrential rain. Despite the pitch having been turned into a swamp, Maruschak catapulted the ball 35 metres into the top corner. The goalie didn’t stand a chance. Players from outside the Far East have to endure chronic jet-lag when playing there on away matches. The region is eight hours ahead of European Russia. Only the local players feel 100 per cent; those from European or Central Russia are always out of kilter. “When you’ve come to Vladivostok to play an important match, adjusting is particularly hard.” Maruschak says. 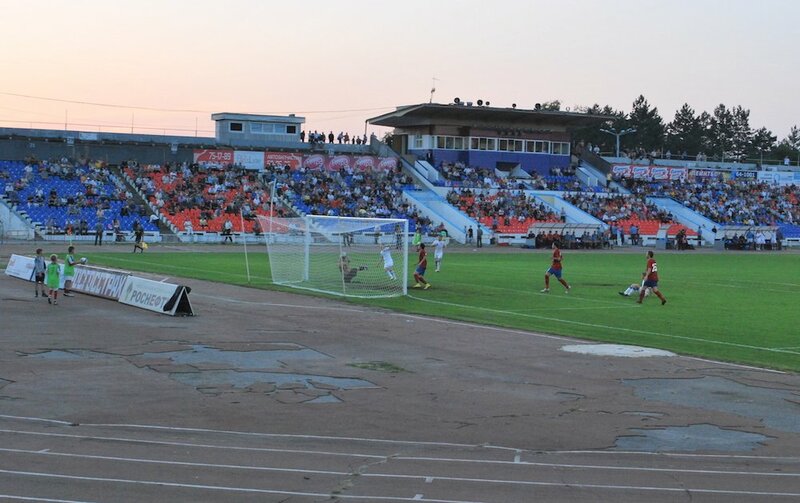 “Getting back to top condition in 24 hours is impossible, and playing with jet lag feels like playing a game on the moon.” Baltika’s last encounter with Luch-Energiya in Vladivostok, in April 2018, ended 0-0 — a common result in these games. This year Baltika has a real shot at promotion to the Premier League. If they do get in, next season will be their first among the nation’s elite in 20 years. It will also spell an end to the world’s most extreme away match — for better or worse.